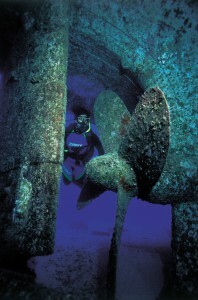 When exploring the underwater world, many scuba divers rely on a waterproof compass to find their way back to the boat. 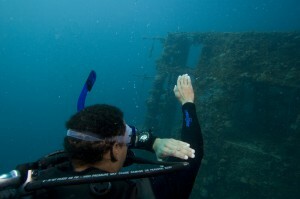 Navigating a shipwreck, however, can be more challenging. The presence of metal (of which is usually in abundance around a wreck) may interfere with the compass’s magnetism, meaning you could get a false reading and end up going the wrong way. 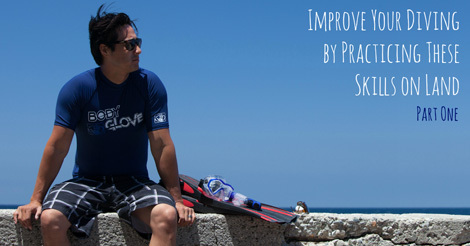 A ll scuba divers, whether they’re diving wrecks or reefs, should have adequate training in underwater navigation before attempting to lead the way around any site. By being more familiar about what works (and what does not) as an underwater signpost, you’ll naturally start to take note of reliable features without even thinking – giving you more time to relax and enjoy your dive. PADI Underwater Navigator is a specialty course that will teach you how to use underwater landmarks to find your way (as well as compass use and more). Search through diving resources such as dive site guides and websites to find divers’ stories, pictures, maps and even 3D tours of the wreck. 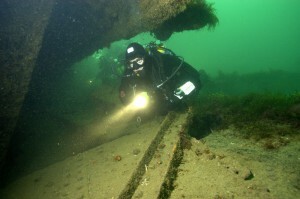 By fully researching the wreck before you do the dive, you can get a clearer idea of the wreck’s layout, appearance and specific features to look out for. You can memorise this, sketch it on your slate or even print out a detailed map and waterproof it for use underwater. As long as you’re observant and pay attention to your surroundings on your dive you’ll be able to use this information to determine your location relative to the wreck and therefore, which direction you need to go. Even if you can’t find any information on a specific wreck you want to dive, or simply haven’t had time to research the layout, you can often rely on common features to help you identify where you are in relation to the wreck. For example, a rudder or propeller may indicate you are towards the stern (back end) of the wreck, whilst an anchor chain or a pointed end could suggest the bow (front end). Try to imagine how the wreck would have looked before sinking, and consider the type of wreck it is. For example, battleships are often top heavy with big guns and armour (and often rest upside-down). Submarines are characterised by a cylindrical double-hulled structure with torpedo tubes a popular feature, whilst steam trawlers are easily spotted from large boilers and winches. The more familiar you are with different ship classes and their associated features, the more you’ll be able to apply this knowledge to the different wrecks you dive. 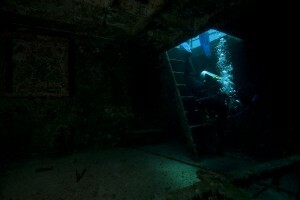 Before attempting to navigate inside a shipwreck, especially when there may be no clear exit during your exploration, make sure you’ve had proper training in the skills and techniques of wreck penetration (PADI’s Wreck Diver specialty course can provide this). You need to be fully aware of the hazards and how to avoid them, and having the correct equipment to assist this process is crucial – such as a wreck reel to help you find your way on a return journey, or a dive light and back-up to allow you to see in darker areas. You also need excellent buoyancy and finning skills to ensure you don’t stir up any silt inside the wreck, which might reduce the visibility and make it harder to find the exit. Being prepared and equipped for penetration is the best way to ensure you can navigate your way in – and back out of – the wreck. If you’re new to wreck diving, navigation or simply want to relax on holiday without worrying about whether to go left or right at every turn, then another option is to use a professional dive guide. 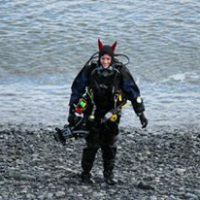 A dive guide will know the site well and not only will they help you find your way around but they’ll be able to point out specific areas of interest and help you get even more enjoyment out of your dive. With the right training and some practice, navigating underwater without a compass becomes easy. 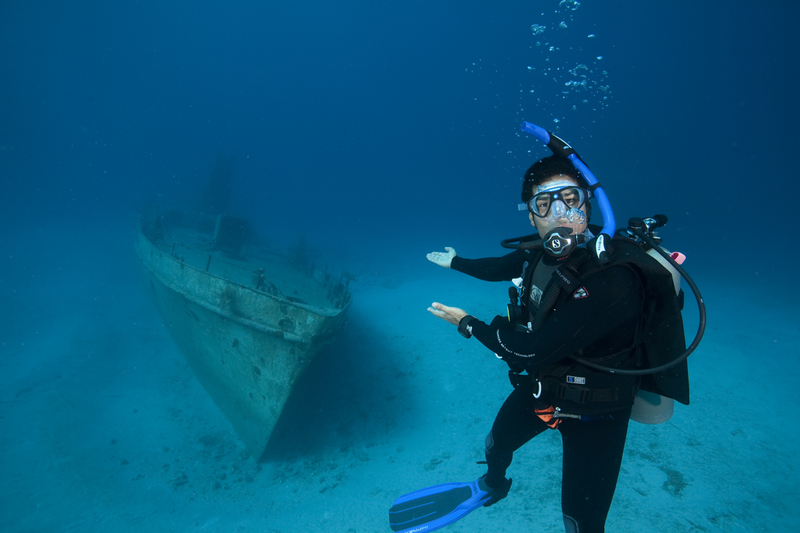 To learn more about wreck diving sites and trips, as well as PADI courses which might help you get more out of your wreck dives, contact your local PADI Dive Shop.